served with a smile and priced with a value you can appreciate. Business Hours: Monday - Friday 7:30 A.M. - 2:00 P.M.
Our Online Order Form is now back in action and ready to SERVE you. Try it out! Too hot, too cold, too far to go out? No problem! Have your breakfast or lunch delivered to your business! Now accepting MC/VISA on business deliveries over $20.00. Specializing in individually catered orders. Jake's lunchroom seats 46 with 9 booths and 10 street view bar stools. Featuring hot entrees & homemade soups October-April. Entering our 22nd year of serving downtown. 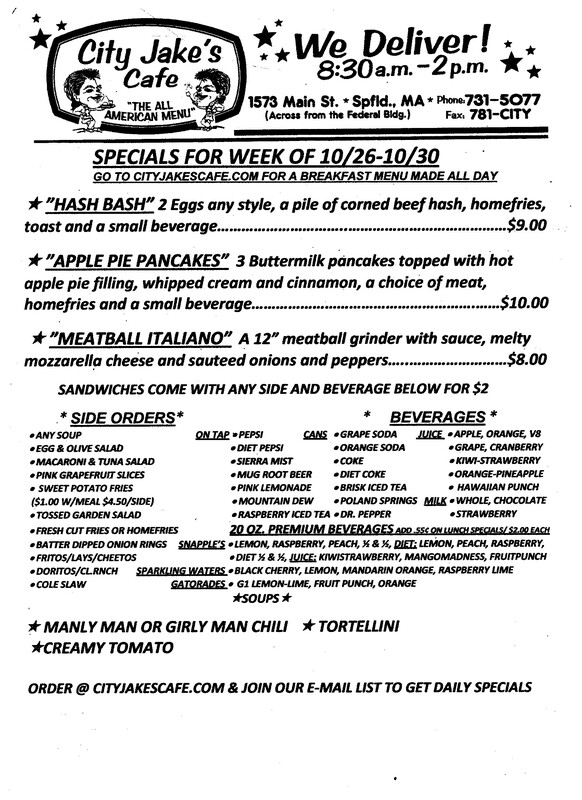 Order online or download an order form, pass it around the office and fax it in to 781-CITY(2489). Orders can be texted to 731-5077 for convenience.